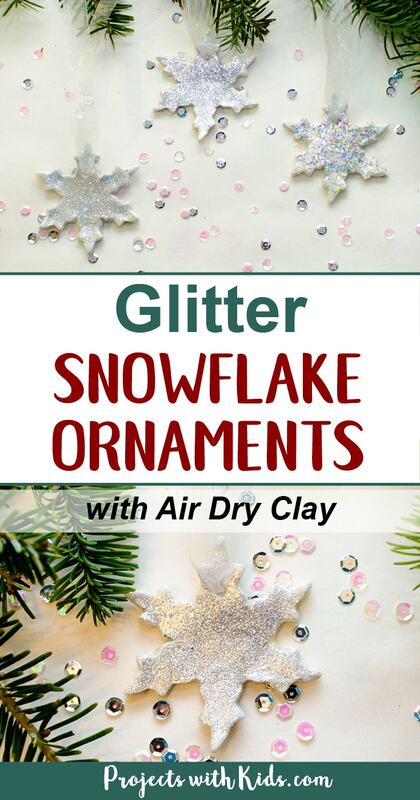 Add some sparkle and shine to your Christmas tree this year with these glitter snowflake ornaments. 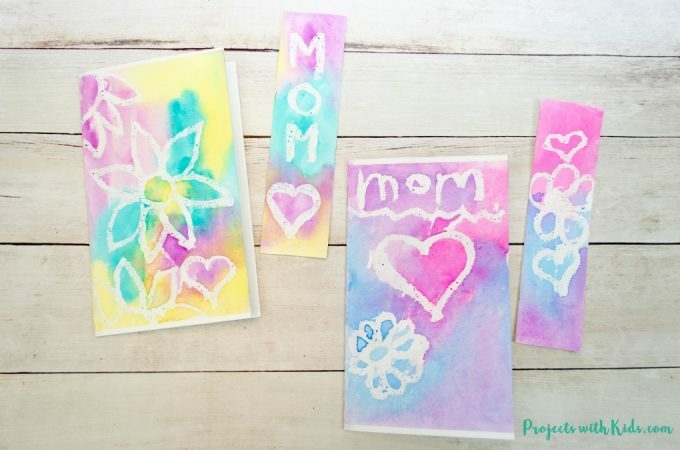 This is a great holiday craft that kids of all ages will enjoy making! 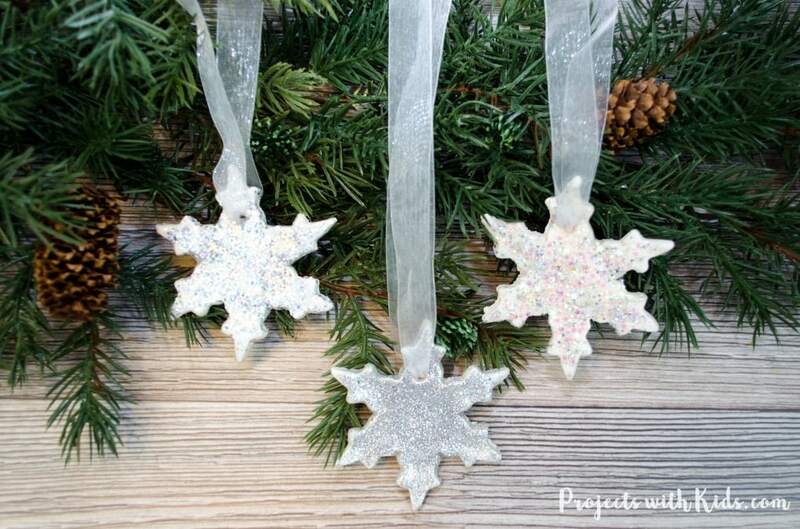 These ornaments can be customized with different types of snowflake cookie cutters and different colors of glitter to make them even more unique. 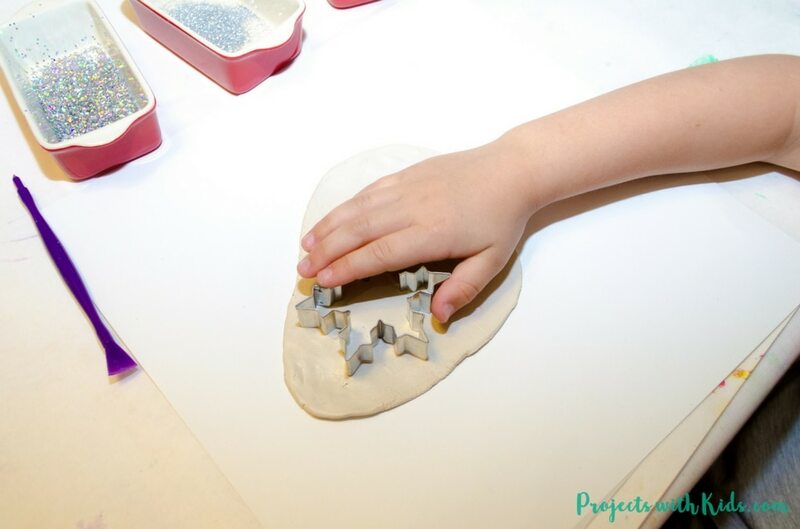 We love working with air dry clay, it’s so easy for kids to work with and the best part is that there is no baking after, just let your creations dry overnight and they are done! This post contains affiliate links, which come at no cost to you. If you would like more information please review my disclosure policy. 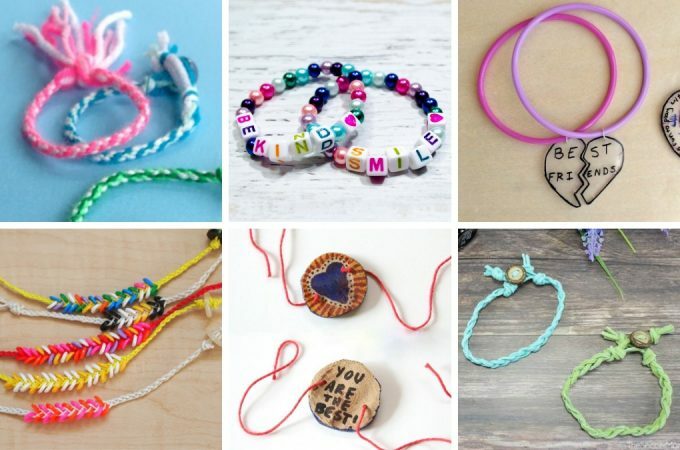 Thank you for helping to support Projects with Kids! Clay rolling pin, play dough tools work great for this! 1. 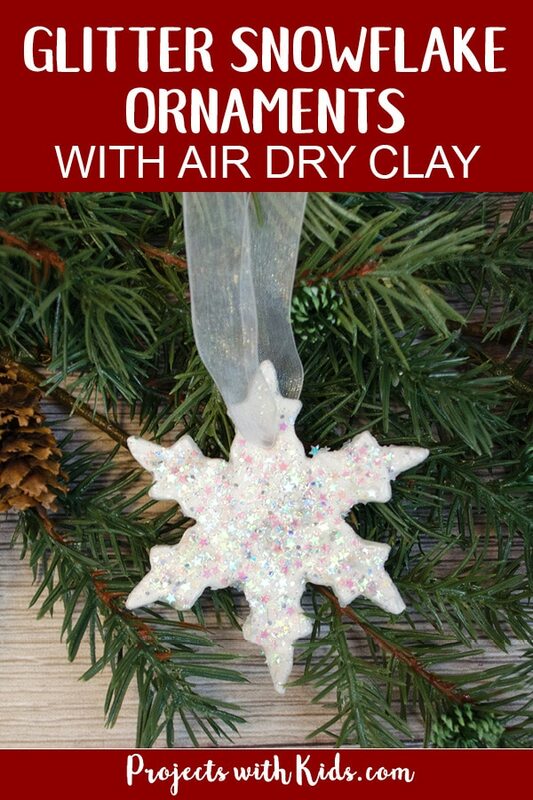 Take your air dry clay and roll it into smaller balls, aiming to get 2-3 ornaments per ball of clay. 2. Let the kids roll out the clay to around 1/4 inch thick. Younger kids might need a bit of help with this. It helps to first flatten the clay out with the palm of your hands before using a rolling pin. 3. Next, take your snowflake cookie cutters and cut out your ornaments. Make sure to press down all the way, younger kids might need some help with this part as well. 4. 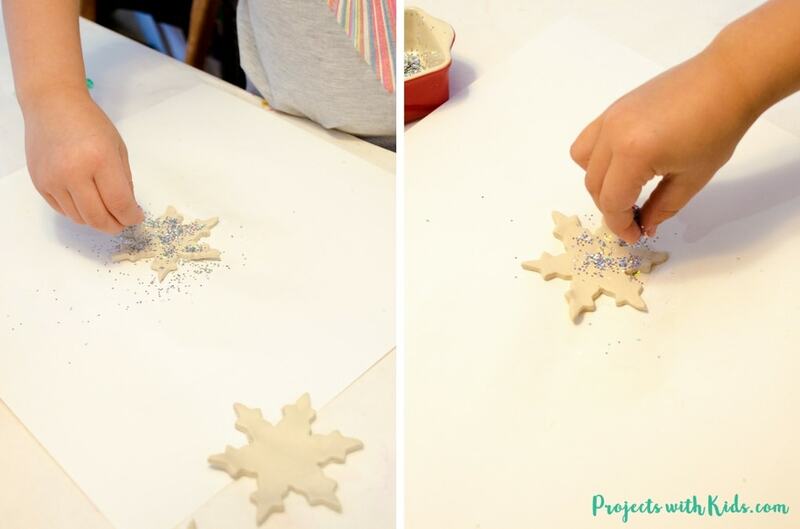 While the clay is still wet, sprinkle your ornaments with glitter, kids love this part! Make sure to cover the whole ornament. Gently press the glitter down into the clay. 5. Using a straw or bamboo skewer, make your holes in your ornaments. Make sure the holes are big enough to put your string or ribbon through. 6. Let your snowflake ornaments dry overnight. 7. Once they are completely dry paint each ornament with two thin layers of Mod Podge to seal in the glitter. This is an important step, it will ensure that glitter from the ornaments doesn’t get all over your house! We painted the fronts and backs of our ornaments just to make sure the glitter was sealed in completely. 8. 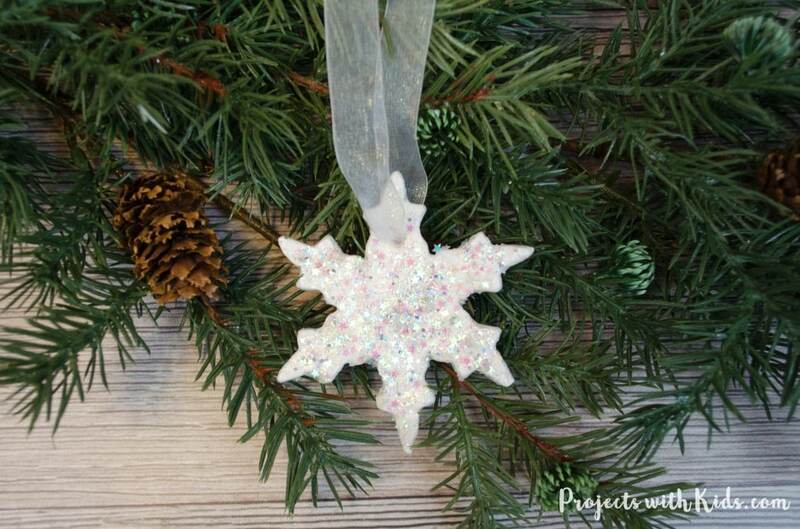 Let the Mod Podge dry completely and then add your ribbon or string to your snowflake ornaments. We made quite a few of these ornaments, some to hang on our tree and some to give as handmade gifts. 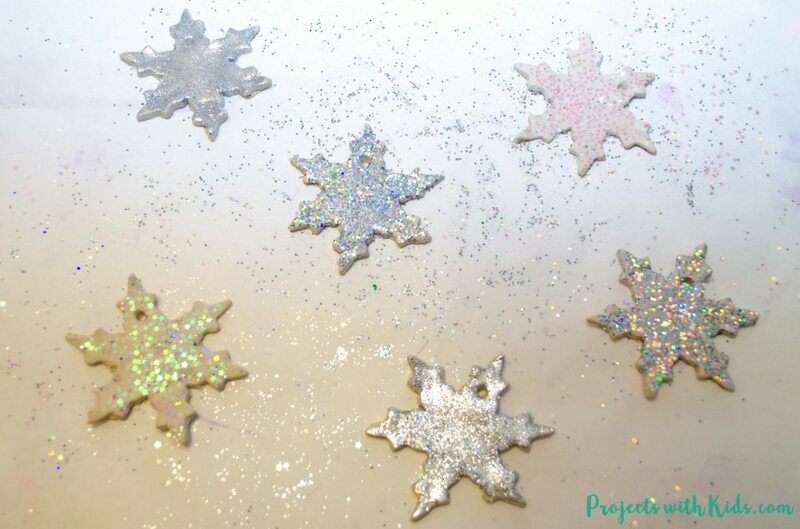 I love how our glitter snowflake ornaments sparkle in the glow of the Christmas lights, they look magical! We love making Christmas ornaments and decorations, it’s such a great family tradition that we look forward to every year! Check out these wreath ornaments with paper straws they turned out so fun and colorful, such an easy craft for younger kids. I love how these magical Christmas lanterns turned out, they look stunning on our mantle! Be sure to follow my Christmas Arts & Crafts for Kids Pinterest board for more fun and creative projects! These are so cute! 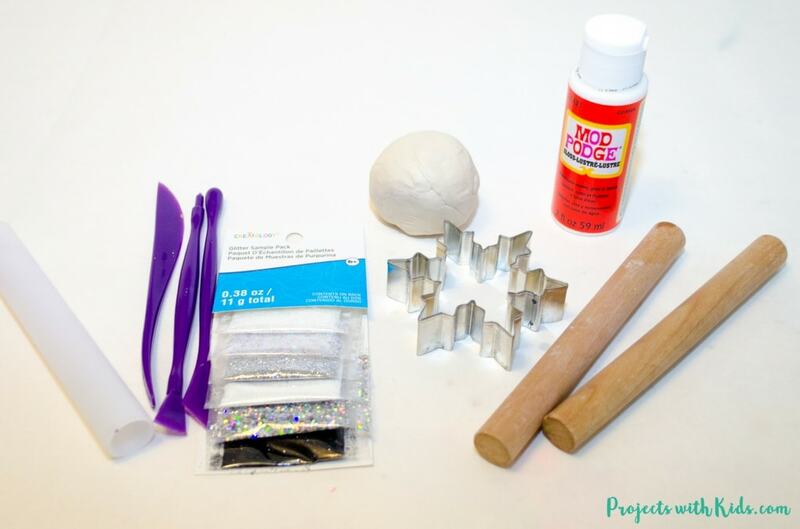 Perfect activity for a classroom activity before holiday break! Thanks Rae, I agree they would be a perfect classroom craft! I love ornaments like this! I pinned it too. My kids made ornaments about 3 years ago, and now every time I hang them up I am reminded of just how quickly time is passing. I can’t believe how little they were when they made them – and they’re still little really. 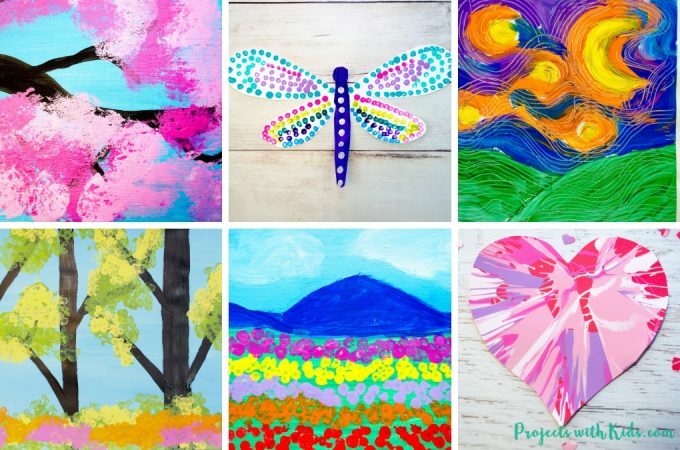 It is an absolutely worthwhile craft for any parent! I agree, I love unpacking our homemade ornaments every year and remembering when we made them. 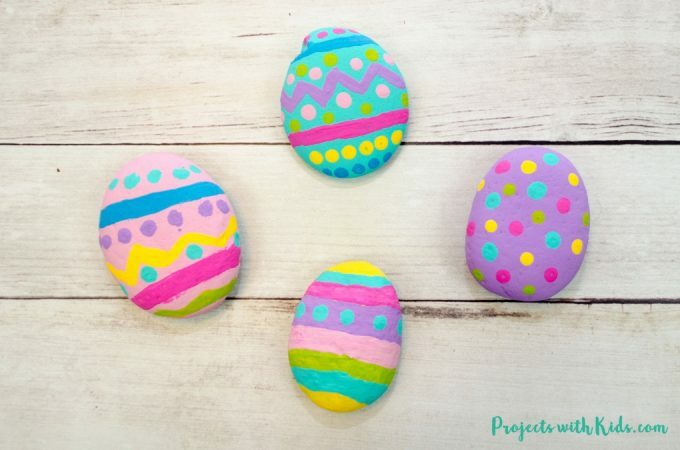 This looks like such a fun craft to do with the kiddos! You’ve been sharing some amazing Christmas crafts. What a cute little craft! Would be pretty as a gift tag embellishment too! Thanks Bree! Yes, it would be cute as part of a gift tag! So pretty. They would make beautiful looking cookies as well! Yes, I have used that cookie cutter to make cookies and they turned out great! 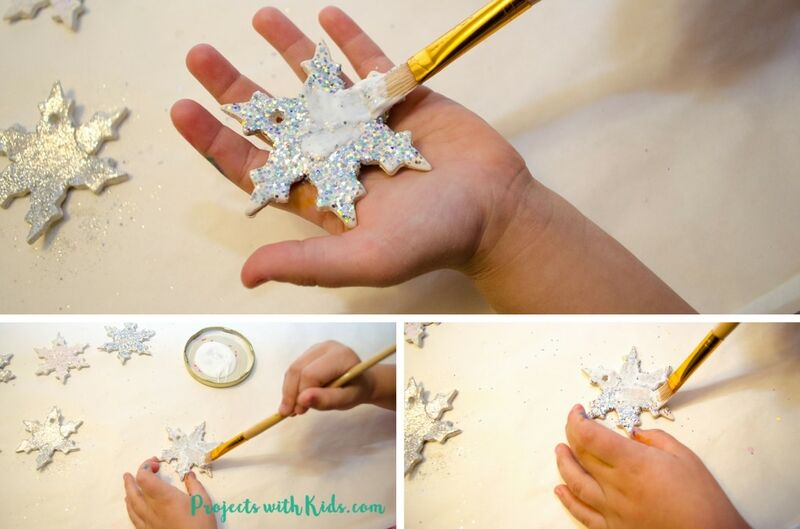 Your snowflake ornaments are so pretty and kids do love using glitter. These came out beautiful! So pretty! I am going to have to try this!